A Summary written by my Guest-writer Kissoon Behari continues from last week’s post. In today’s post he deals with Section Three of the Devi Mahatmyam. Chapters 5 to 13 fall under this Section which are dedicated to Mahasaraswati. Thus the Summary concludes with this instalment. Sumbha and Nisumbha, two proud and powerful demons, had conquered the three worlds and looted the heavens. The exiled devas remembered the boon that the Divine Mother had granted them: ‘If they called upon Her in times of difficulties and troubles, She would put an immediate end to all their sorrows.’ So they went to the Himalaya Mountain and sang in praise of the Devi and worshipped Her in various ways. The hymn that the devas sang is called the “Aparajita Stutih”. (Aparajita means “The Invincible”.) This stotra is also known as the “Tantrika Devi Sukta”. After the shining Ambika had issued forth, Mother Parvati turned dark, and was thereafter called Kalika. Canda and Munda, two servants of Sumbha and Nisumbha, informed their lords of the exceedingly beautiful Ambika. Sumbha, filled with a desire to possess the Devi, sent a messenger to Her so that She might quickly come to them in love. But the Mother Durga answered that She had made a ‘foolish’ promise: Only he who conquered Her in battle and removed Her pride would be Her husband. The messenger indignantly returned. The reply annoyed and angered Sumbha. He then sent Dhumralocana to fetch Her, by force, if necessary. But the Devi reduced him to ashes by merely uttering the syllable ‘hoom’. The army, too, was destroyed. Sumbha was enraged when he heard of the fate of his general and his army. In his fury, he ordered Canda and Munda to bring Her by force. When Devi Ambika, seated on Her lion on a golden peak, saw the army of demons, Her face became dark with anger. From Her forehead issued Kali. Her form was terrible, and she was armed with a sword and noose. She destroyed the entire host of demons and beheaded Canda and Munda, and presented their heads to Candika. Because She had slain Canda and Munda, Mother Candika playfully said that She (Kali) would be famed as ‘Camunda’! Sumbha was overcome and infuriated. He ordered the immediate mobilisation of all demons. The Divine Mother and Kali were surrounded on all sides. Then there issued from the bodies of all the devas their saktis who went to help Candika, Whatever was the form of the deva, whatever his ornaments and weapons, whatever his vehicle – in that very form his saktl advanced to fight the asuras. Thus from Lord Brahma emerged Brahmani, carrying a rosary and water pot, and riding on a chariot drawn by swans. 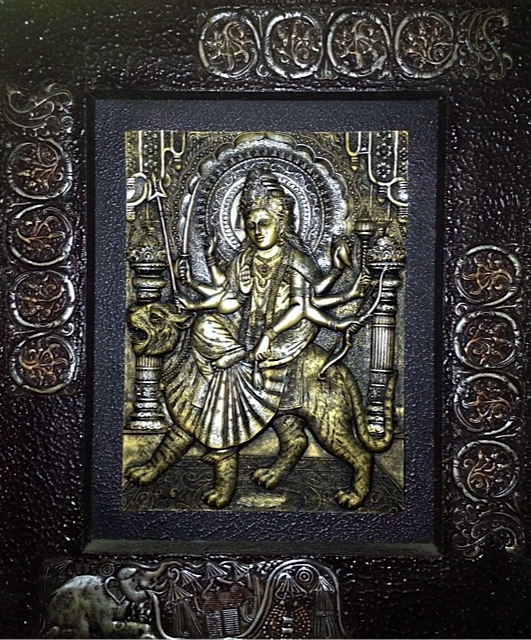 Mahesvari, the sakti of Lord Siva, was seated on a bull, holding a trident and adorned with the crescent moon. The sakti of Lord Visnu was seated on Garuda, holding conch, club, bow and sword. The Goddess Ambika (here identified with: Durga or Chandi) Leading the Eight Matrikas in Battle Against the Demon Raktabija, Folio from a Devi Mahatmya – (top row, from the left) Narashmi, Vaishnavi, Kumari, Maheshvari, Brahmi. 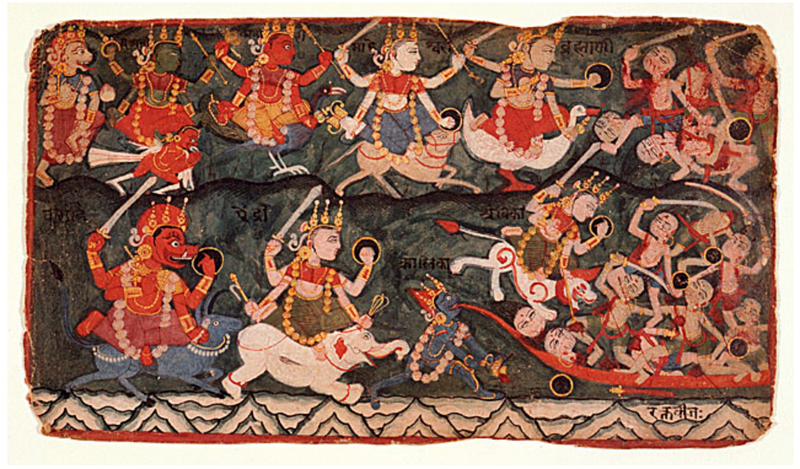 (bottom row, from left) Varahi, Aindri and Chamunda, drinking the blood of demons (on right) arising from Raktabija’s blood and Ambika. From the body of the Devi Herself there issued her own sakti. It was fierce and terrible. The wrath and indignation of the demons were roused, and they made an onslaught on the Devi. But the saktfs crushed the demon hordes. Seeing this, the great asura Raktabija strode forward into battle. When his drops of blood fell to the ground, there rose from the earth as many asuras as powerful and fierce as Raktabija himself. The more he was wounded and the more blood fell on the ground, the greater grew the demon forces. Then Candika asked Kali (Camunda) to quickly take in the drops of blood from Raktabija as She struck him. In this way, Raktabija grew weaker and weaker, and eventually lost his powers. Having become bloodless, the once powerful demon fell helpless on the ground, never to rise again. Enraged by the annihilation of Raktabija and his army, Sumbha and Nisumbha made an assault on the Devi. Nisumbha struck Her on the head, but She rendered his attack ineffectual, and flung him on the ground. Seeing his brother unconscious, Sumbha became furious. He approached Her in his chariot, splendid and shining, holding excellent weapons in his eight arms. She smote Sumbha who lost consciousness. Then up rose Nisumbha and gave battle to the Devi. Candika pierced him in his heart. From his heart came forth another person of great valour and strength. The Devi laughed and severed his head. When Sumbha saw his brother who was as dear to him as his own life was slain, he was filled with a raging fury. He accused Her of being puffed up with the pride but was resorting to the strength of others. The Devi smilingly answered, “I am all alone in the world. Who else is there beside Me?” So saying, She absorbed all the saktis into Herself and stood alone. A long and dreadful combat ensued. The Devi destroyed all his weapons, whirled him around and flung him down to the ground, and pierced him in the chest with a deadly dart. After the destruction of Sumbha and the annihilation of the demons, the universe became happy and there was peace everywhere. Then the joyous devas sang praises to the Divine Mother. This hymn is known as the “Narayan! Stutih”. The devas received a boon from the Devi: She would destroy all their enemies and all the afflictions in the three worlds. She added that She would overcome all obstacles and difficulties of anyone who, with concentrated mind and deep devotion, prayed to Her constantly with these hymns. Having blessed them all, the Devi vanished on the spot as the gods looked on. In this chapter, the Divine Mother herself lists the benefits of reciting the DM. The Devi will put an end to all troubles of one who constantly recites the DM with devotion and concentration. These include all forms of afflictions from external sources, such as from natural calamities and people and animals; as well as from internal or psychological causes. The DM should be recited on the 8th, 9th and 14th days of the month. She will always dwell where this poem is chanted. Even if the householder devotees perform her sacrifice and worship without proper knowledge of the rituals, She will still happily accept them. The chanting of the hymns makes the mind pure, and glorifying Her brings the devotees closer to Her. The Rsi concludes by saying that it is the Devi who has created the universe, and She who causes delusion. Taking the form of Lakshmi, She bestows prosperity; but she also brings ruin and destruction. When She is praised and worshipped with flowers, incense, perfumes, etc, She bestows all forms of wealth and joys and a mind that turns towards dharma. The Rsi once more says that it is the Devi who brings about delusion even in men such as the king and the merchant who have the ability to discriminate. He entreats them to worship the Devi who grants both worldly and heavenly enjoyments as well as final liberation from the cycle of births and deaths. Suratha and Samadhi wanted a vision of the Mother. They thus practised penances and control of mind and senses, and worshipped the Mother with puja and havan for three years. Then Mother appeared to them and granted them boons. The king would regain his lost kingdom, and when he died, he would be born as Savarni, the son the Surya, and become the eighth Manu. The merchant received that supreme knowledge that brings about final liberation. 1 When Mother Parvati asks “Who is being worshipped?” Ambika emerges from within Her and answers. The extremes of ignorance and knowledge are seen in Her. Spirit and knowledge are of the quality of light, hence Ambika is also called “Gauri, which means “The Fair”. Within each of us the same range of possibilities exists. All knowledge is within us, and each soul is potentially divine. The more this divinity is expressed, the more does one shine. 2 The aspect of evolution is stressed in Mother Parvati: As daughter of the Himalaya Mountain, she is the mineral kingdom; Her mount is the lion, king of beasts; and as Kausiki, She is knowledge, secular and spiritual. Thus, in Her, all levels and aspects of creation are symbolically embodied, and She is therefore the Supreme Queen. 3 Although the Supreme Divinity is before Canda and Munda, they, being of a tamasic nature, can only see the outward beauty of the Mother. The messenger, too, is unable to understand the deeper significance behind the Mother’s reply: “He who will conquer Me in battle, he who will break My pride, he who is My match in the world in strength shall be My husband.” Siva is Her husband. He is beyond the control of the gunas, completely free from attachment to the world. As the world with its maya cannot bind him, we say that he has conquered the world, that is, has conquered the pride of the Mother when She has expressed Herself as the universe. None of the demons have any notion of the divinity they confront. Knowledge attained is proportional to one’s sacrifice or austerity (tapas) and self-surrender. 4 Sumbha and Nisumbha are really robbers who have looted the world of all its material grandeur. What an irony that, in a bid to allure the Divine Mother to them, they are offering them to Her who is Herself all wealth and beauty! 5 There is Divine Will and Individual Will. When the Individual Will subordinates itself to the Divine Will, that is, surrenders to Divinity, it is the way to beatitude. But when the Individual Will goes counter to the Divine Will, it is the way to hell – if not hell itself! The devas have such powers and knowledge as will allow them to perform the work of the Mother. But the demons channel all their energies to disrupt Her Divine Plan. Accordingly, a power sufficient to overcome the demons is released by the Divine Mother at different stages in the contest. Dhumralocana: The name means “smoky-eyed”, and so suggests veiled perception. He is thus ignorance and the grossest state of egoism. The Devi shows annihilates him by a mere “hum”. Canda and Munda: They were the first to have a vision of Ambika. They represent the lower and more horrible aspect of our ego. When the Devi Candika encounters these demons, there emanates from Her forehead the awesome and ferocious Kali. As Her origin is associated with the third eye, She represents the intellectual and intuitive faculties.Kali seeks out and destroys the little lower self (which is ruled by rajas and tamas) so that it will attain progressively higher levels of knowledge. Sumbha and Nisumbha: Sumbha is the more enlightened aspect of egoism. The word itself means ‘to shine’. Nisumbha is attachment. Both Sumbha and Nisumbha seek enjoyment in the external world. Hence Sumbha declares, “We are the enjoyers of the best objects”. But they are slaves of their passions. 6 Sumbha accuses Mother Durga of pride and arrogance, but really this is an instance of projecting his own qualities onto Her. She withdraws the Saktis, the numerous powers that She had projected, and stands alone. In this act, She reveals to him that She is the One behind the many, that the entire creation is but Her own Self. Next Post: De’light’ful Diwali ! It is really illuminating to learn about the spiritual significance of the chapters of ‘Durga Saptashati‘ in such a lucid fashion. I am saving this series to read this year as well. I informed Kissoonbhai, the author of the 3 part series and he was glad. Very few people knew about the spiritual significance of ‘Durga Saptashati‘. It was nice, useful & informative going through this site. All our scriptures are written in such a way that if we try to understand the spiritual significance, IT WILL BE A JOURNEY WITHIN. My humble pranam once again at your feet!